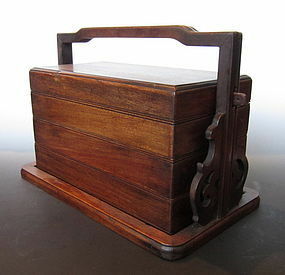 A hardwood stacked box attached with a holder to carry the boxes and a rod which slides inside the lid of the box to keep the box closed with a lock. Age: 20th century (c1950). 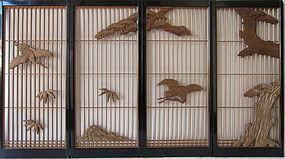 Size: Height: 10.75" Width: 8.5" Length: 15"
A four panel shoji screen decorated with carvings of cranes, pine, and bamboo framed in a black lacquered frame. The screen is often seen on the side of a Japanese alcove so that the light during the day can shine in and illuminate the alcove while protecting the piece decorating the alcove. Age: Late Showa Era:1970-1980. Size: Height: 39.5" Length: 69.75" Width: 1"
Antique Chinese very heavy and dense hardwood table, very beautifully and ornately carved all over with scrolling vines and dragons motif with key fret motif along edges, dark color, Republic Period. Size: 34" high x 66 1/2" wide x 27 1/2" deep. A simple utilitarian tool often used by Japanese carpenters and woodworkers known as a sumitsubo or an ink pot used to measure and portion pieces of wood. 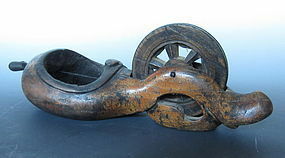 Traditionally, the sumitsubo were made by carpenters and how well a sumitsubo is made showed how skilled a carpenter was. 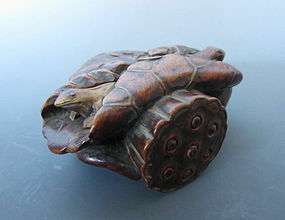 Age: 19th-20th century Size:Height: 3.75" Width: 4" Length: 11.5"
A small hardwood carving of lotus leaves with small frogs and fish set between the curled and the underside sections of the leaves. 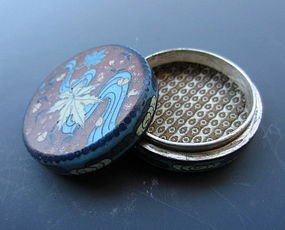 The frogs and the seeds found in the pod of the lotus flower can slightly move, giving the piece more action and life. 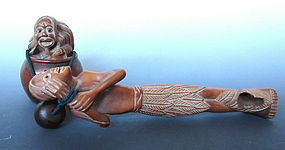 Age: 19th-20th century Size: Height: 1.5" Width: 2.8" Length: 3.5"
A set of a tobacco container carved in the form of either two sages or eccentric spirits. The container is carved in the form where the figure is sitting inside a jar while the other is has the distinct eccentric smile seen in images in sages. The piece contains a signature which reads Nissho Age:20th century Size: The container: Height: 3.5" Diameter: 2.1" The figure: Length: 1.75" Width: 1.5" Height: 8"
An archaic bronze vessel decorated with geometric motif and scrolling vines. The vessel is known as a dou, which was used to offer food to the gods. 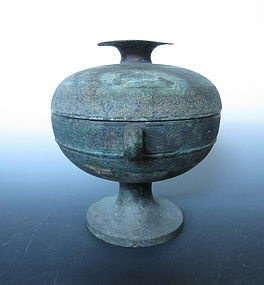 Additionally the chinese character for bean is shaped in the same way as the dou vessel where it was thought that beans were offering inside the vessel. Age: Warring States Period Size: Height: 8.25" Diameter: 9"
A small Japanese cloisonne container. One side is decorated with maple and cherry blossom among flowing water (known in Japanese as unkin) and the other side is chrysanthemums and flowing water (known as kikusui). The interior is covered with a brocade fabric. No signature is found on the piece. Age: Meiji Period. 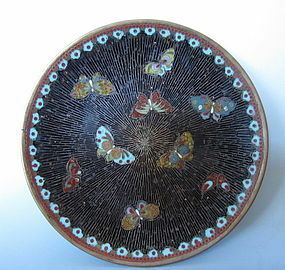 Size: Height: 0.5" Diameter: 1.3"
A cloisonne plate decorated with motif of butterflies with a black with speckled gold base. The plate is thought to be done by the Honda school, one of the several artists that are part of the Owari Cloisonne (Owari Shippo) group. Age: Meiji period. 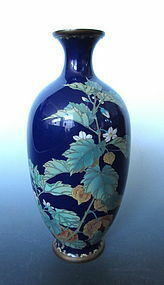 Size: Height: 1' Diameter: 6.1"
A resplendent Japanese cloisonne vase decorated with motif of a plant often seen during the autumn in Japan. The Japanese name is Hozuki, while in English it is known as either Japanese Lantern or Winter Cherry. The motif symbolize the height of autumn and the plant is often used in flower arrangements. Age: 19th century Size:Height: 7.5" Diameter: 3.25"